Vergesst nicht, bei Cathy vorbeizuschauen, die In a Vase on a Monday ins Leben gerufen hat! Don’t forget to go over to Cathy who is so kindly hosting the meme In a Vase on a Monday! Weiter In a Vase on a Monday: Happy Birthday! What a fabulous collection of perfectly beautiful clematis. Good luck with the new book. 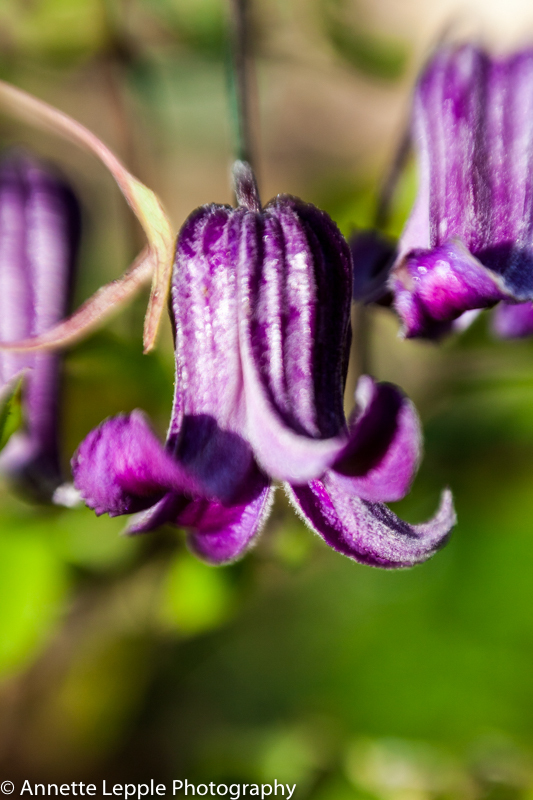 Great promotion of herbaceous clematis, I agree, they are very under used in gardens and yet they are so easy. 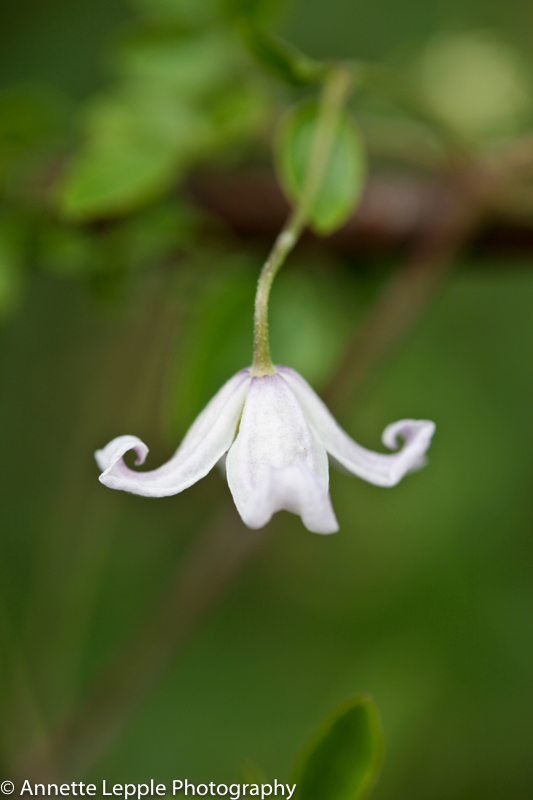 I fell in love with Clematis x durandii years and years ago when I first saw it at Sissinghurst. Good luck with the book. It’s one of those that cope quite good with dry soil which is handy for our climate/type of summer. Do you think it would grow in a pot? Thanks for the recommendations. I just remember the amazing colour or Durandii and maybe unruly would meal it would deal better with the heat! Delicate is always a worrying term on this garden. With delicate, I was refering to the flower shape. I don’t grow to many ‚delicate‘ things in my garden, I’ve the same problem as you. As for durandii, it still survives in my last garden which gets no attention anymore, never mind water. 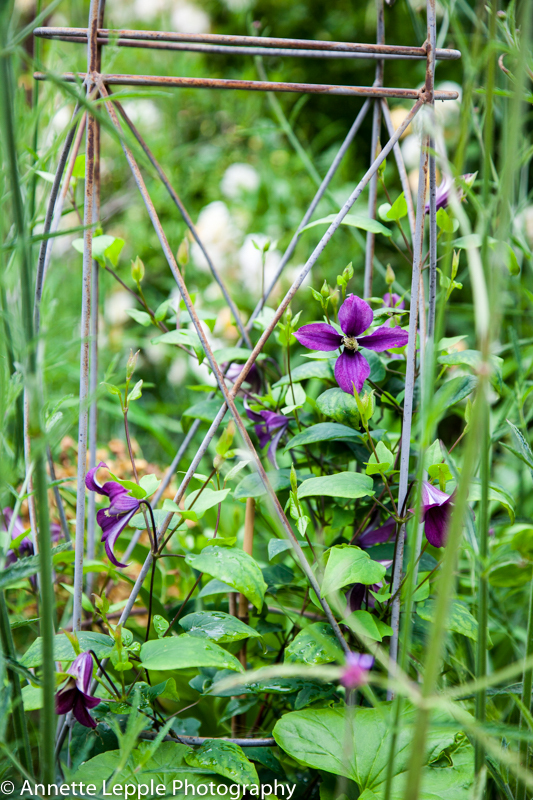 Eine Vielfalt allein von Clematis…einfach toll!! 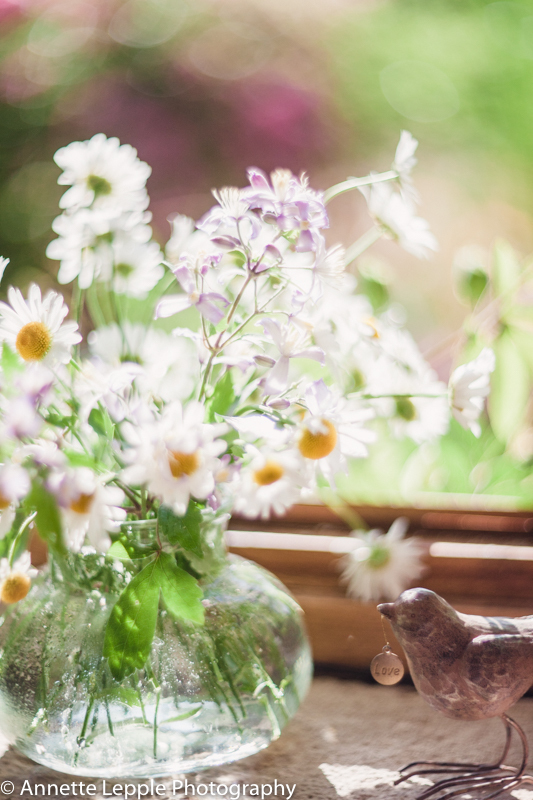 Your daisies look right at home in the open window. Magnificent clematises. Seeing that Clematis Rooguchi makes me want to run right out and try it again. I was given one by a neighbor but didn’t know at the time how to take care of it. Glad you’re busy with an interesting project. Best! 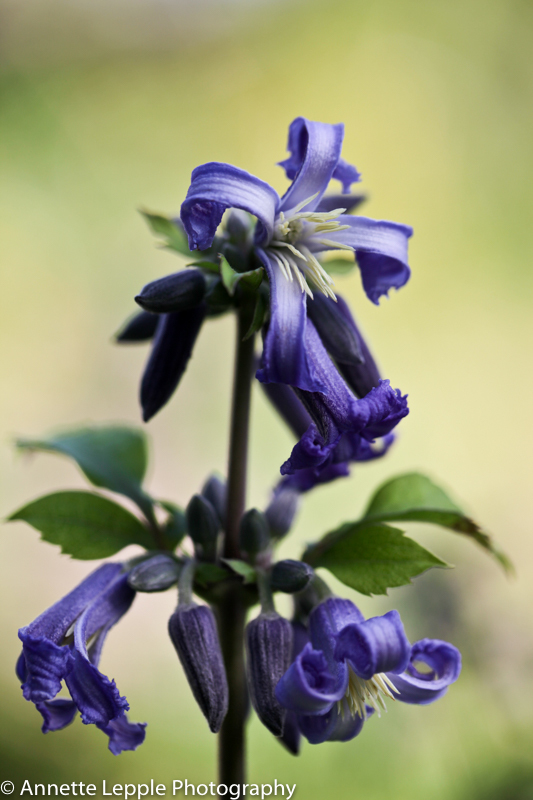 Glad you are back…and thanks for broadening my knowledge of herbacious clematis. 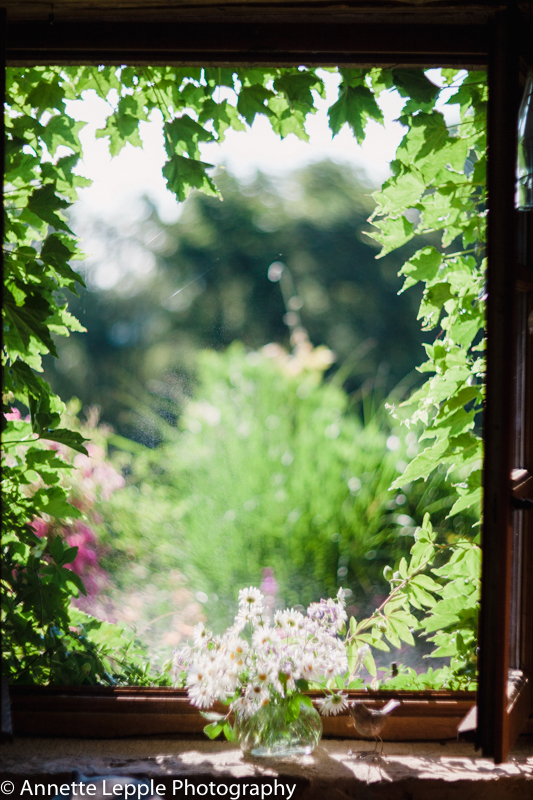 Congrats on the new book….and wow you have such a collection of herbaceous clematis. They don’t grow well here sadly. And your vase is beautiful! That is such a pity, Donna, why would that be? 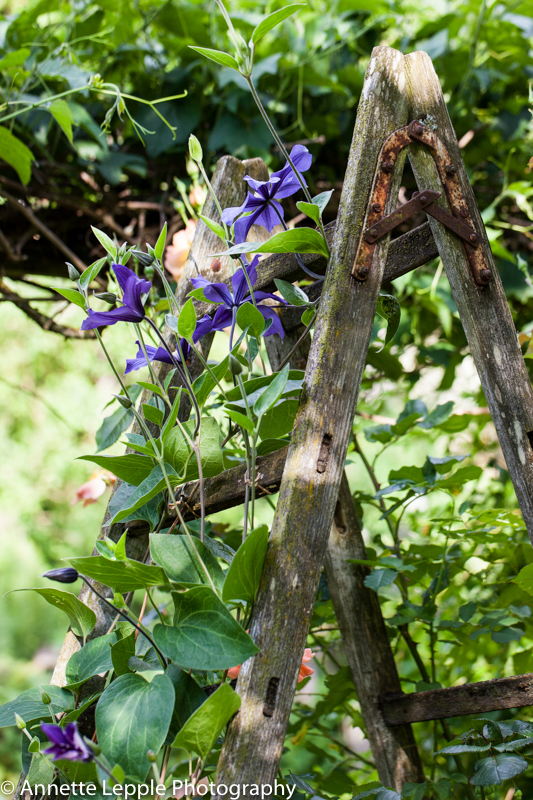 Ooh, all those lovely herbaceous clematis – I don’t have as many as you but will no doubt be adding more when my year of abstention is up. Not sure if I have used jouiniana in a vase before – it looks very at home there with the ox eyes. Thnaks for sharing and hope the book is going well! You keep trying to entice me Annette! 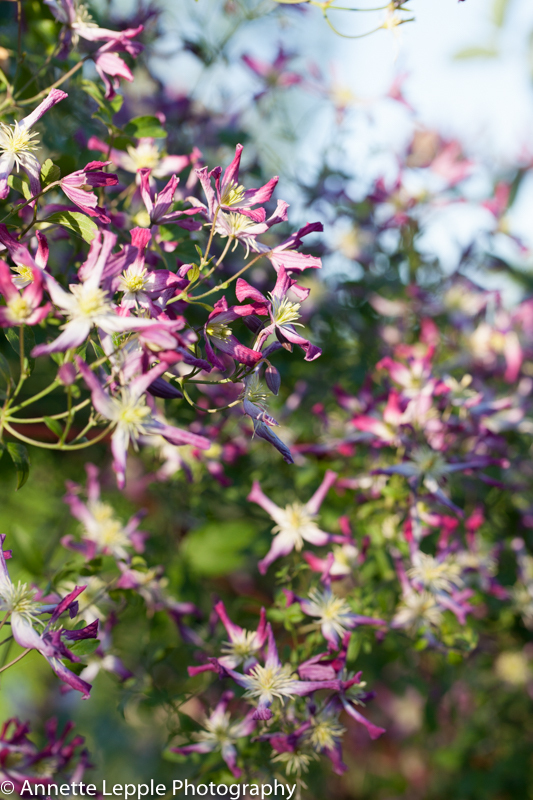 You have so many of the clematis, I saw some beauties last year at Great Dixter but have yet to plant one. You have reminded me. Good luck with the book writing no wonder you do not have much free time for the blog! Viel Erfolg und Glück mit dem neuen Buch! Ich wusste gar nicht, dass es eine Staudenclematis gibt. 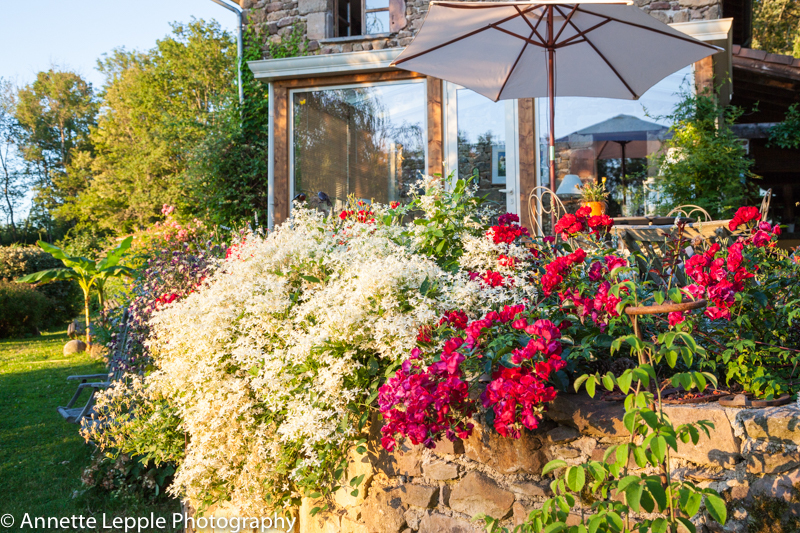 Ein Nachbarhaus hier hat eine wunderschöne Clematis – das sieht immer aus, als wenn sie einen Sternenvorhang am Haus hätten. They are all gorgeous, and your vase with your little bird is magical! Enjoy these summer days and don’t work too hard Annette! Thanks, Cathy, found the bird recently and just had to bring it home! I think books should be written in winter but I try to relax and enjoy my garden too. wie schön wieder von Dir zu lesen! Meine Bourbonrosen mögen das Wetter auch nicht so sehr und haben mit Sternrußtau zu schaffen. Mme Pierre Oger hat einen Radikalschnitt bekommen! Bei deinen Clematis sind mehrere dabei, die meine Begeisterung wecken könnten. Besonders „Fascination“ finde ich hübsch! 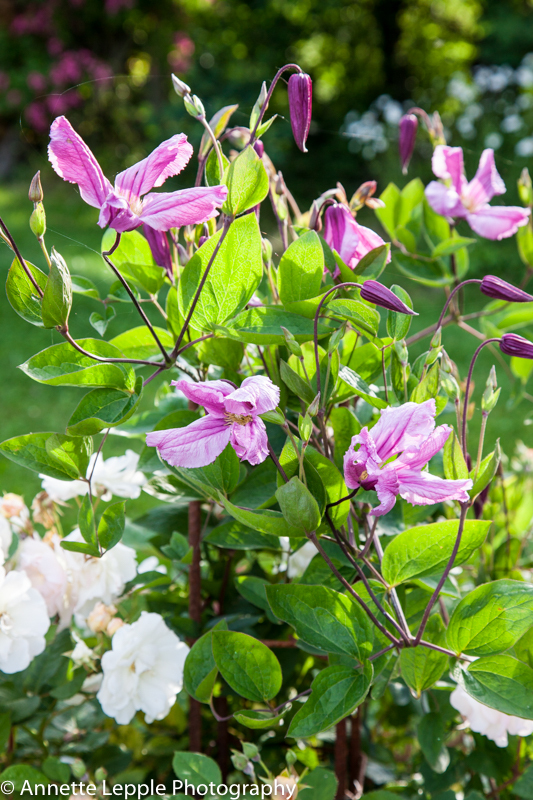 Mit den Clematis in unserem Garten ist das so eine Sache…einige wachsen toll, andere garnicht, ohne dass mir bewußt wäre, warum! 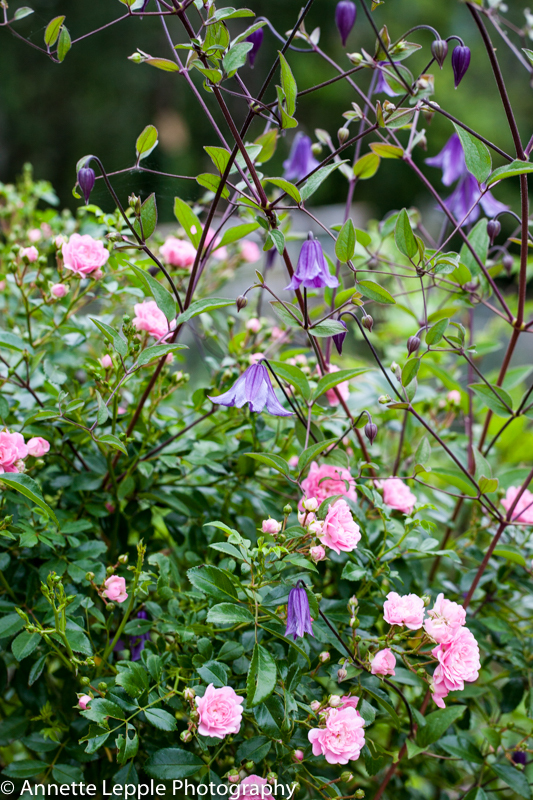 Eine bezaubernde Clematis texensis „Princess Kate“ habe ich letzte Woche zwischen Holunder „Black Beauty“ und Rosa glauca gepflanzt, ich hoffe es wird ihr dort gut gefallen! Bin gespannt auf dein neues Buchprojekt! Wow, what a wonderful collection of Clematis! 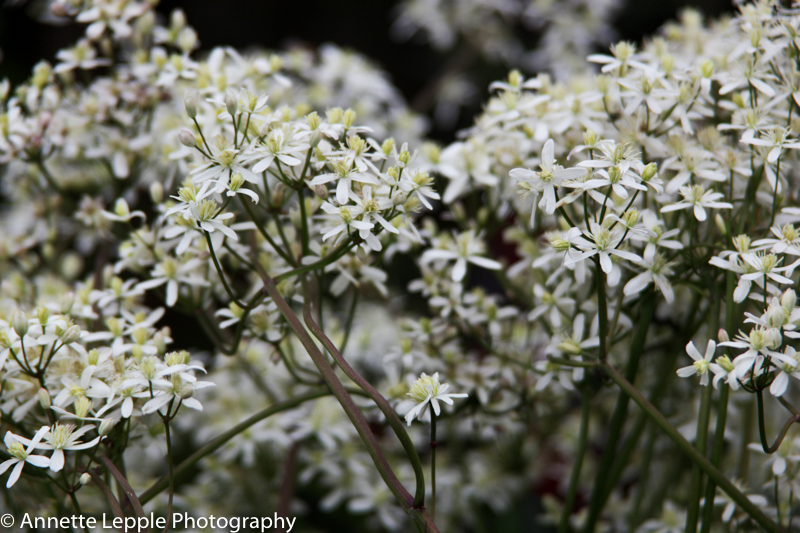 I’ve never had much luck with the large-flowered varieties myself but I have grown sweet autumn clematis (C. paniculata). Best wishes with all your summer projects. Such gorgeous images Annette – I just love the one with the vase and the way it is framed. Beautiful. You are so good – another book, how fabulous! Wunderschöne und augenschmausende Bilder. Es macht richtig Spaß einzutauchen in all diese Pracht. What’s not to love about clems Annette especially the smaller flowered ones. Your comment comparing jouiniana ‚Praecox‘ to a small but endearing monster struck home with me. I planted this years ago and oh how it spreads and weaves 🙂 The butterflies certainly enjoy it. I’ve made a note to find about more ‚Fascination‘. Good luck with the new book. You have been busy collecting and planting as well! Beautiful, and glad you found some time to post here. Somehow you manage to keep up so many projects all while summer is calling you outdoors to indulge in some deserved rest. What an exciting time of year! Hi Frank, lovely to hear from you. It’s actually a bit tiring at the moment with so much going on so I shall probably soon collapse underneath that banana ;). I’m a plant person through and through and grow lots of different ones. Sadly I can’t have woodland plants but I’m seriously tempted to do a dry garden but hopefully sense will get the better of me! 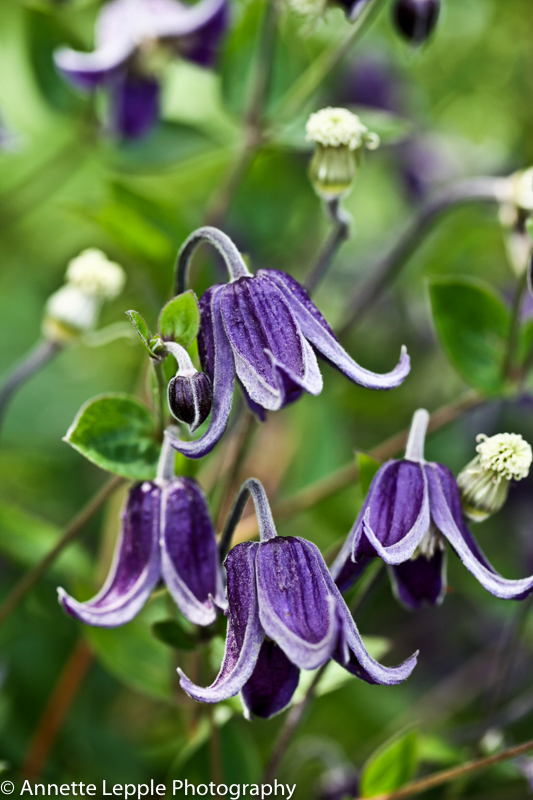 Wunderschöne Bilder… besonders diese Fülle von Clematis hat es mir angetan…. Einen wunderschönen Sommer! [D] Exquisite arrangement, Annette! Didn’t expect you to write in German then English, so just got on with the German. Just a few idioms I struggled with, and today I have learned that Beet means garden border! In der 90-er Jahren wohnten wir in Ochsenfurt, Unterfranken. Wir beschaeftigten uns berueflicherweise – bei der ‚Lueckeerschliessungsprojekte‘. So mussten wir beide – sowie auch unsere Kinder – Deutsch ganz schnell lernen! 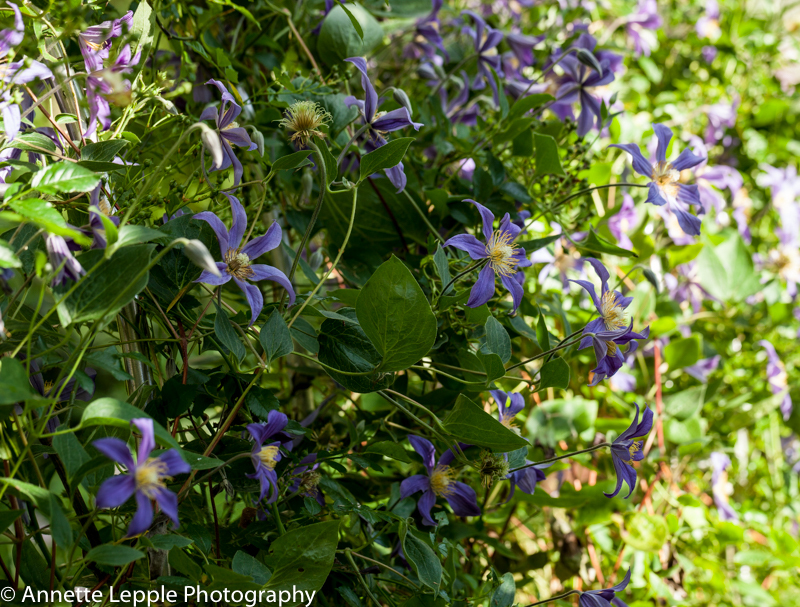 Clematis are such varied and pretty flowers. I’m in love with them, too! terrific collection. I can see how you love them. 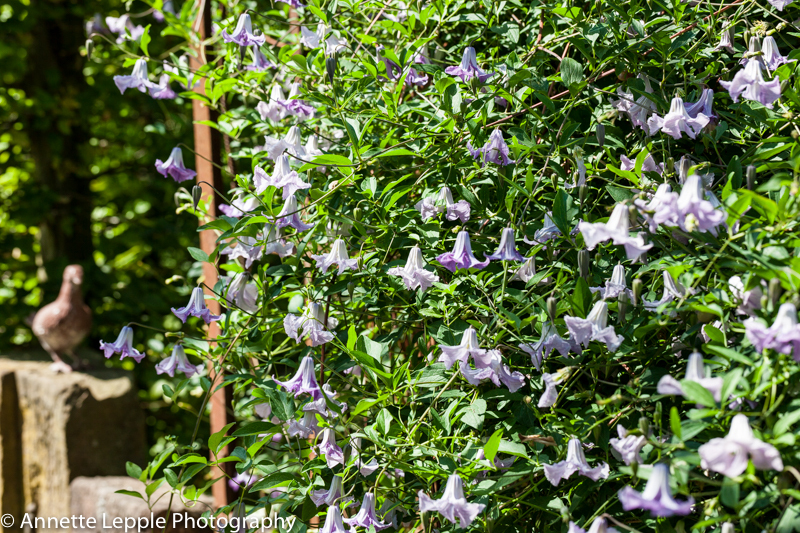 There seems to be a clematis for every month of the year.